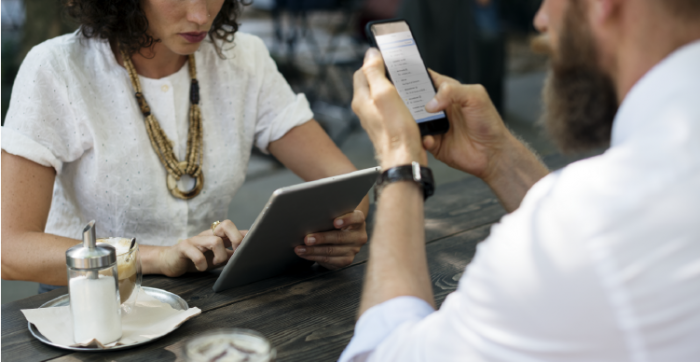 It’s fair to say that more and more businesses are adopting remote working policies, however these tend to be focused on sales and customer engagement roles. In 2018 this focus is likely to extend to additional remote based roles including customer service, security, engineering, remote field reporting and surveys. Key to all of these roles will be the efficient use and transmission of data to and at the point where it is most effective. With greater connectivity coming from 5G, 4G/LTE micro-cells and public WiFi access it will be easier for companies to appreciate the benefits of a connecting mobile workforce in terms of accuracy and timeliness of data e.g. processing clients, workflow management and even troubleshooting. Added to this the options for on-demand video and video conferencing to accomplish tasks like training and assisted troubleshooting. In the UK, Apple devices are definitely the popular choice and the majority of user favor these over Android. However, this is not the case in the rest of the world where 70% of European business choose to deploy Android devices from Samsung, Google, Huawei and Motorola, basing their decisions on security and cost. With an expanding mobile workforce, it is likely that Android will start to see greater market share in the UK as companies look to manage costs to roll-out an increasing number of devices. The adoption of Bring Your Own Device seems to have stalled in recent years and it’s likely with recent security threats and scares this will continue. Companies are choosing to increase investments in their mobile strategies to ensure control over devices and the data they hold, with larger organizations migrating outsourcing this entirely to DaaS (Device as a Service) providers. With GDPR looming and the increased focus on security and customer data, we are seeing a rise in software applications that provide functionality directly targeted at GDPR and data usage policies. Throughout 2018 we can also expect mobile device manufacturers and service providers to be marketing enhanced solutions, encryption and app security for data loss prevention (DLP) as well as privacy control. Companies will also be looking to ensure that their own mobile policies and endpoint security stand up to scrutiny and ensure that their MDM (Mobile Device Management) strategies allow for timely security patch roll-outs and device wiping. Whether you are rolling out applications for the use of your internal staff or providing apps to engage with your customer base, it is clear that mobile device and app usage is increasing. There is nothing to suggest that this will not continue to be the case throughout 2018 and beyond. So, with more and more users connecting to both private and public networks it is vital that companies increase their analysis and monitoring of device and application usage to ensure they fully understand how users engage and what their experience is, allowing businesses to refine applications and network access to maximise usage. Over the past year, we’ve seen a far greater drive from companies to understand how they can leverage mobile device usage within their businesses to reduce costs whilst increasing efficiencies, productivity and revenue. We’re currently working on a number of projects that allow remote workers to record data in the field that is immediately synchronized with their Head Office. These include a company wanting to manage all their assets over multiple sites, a security company wanting more information from guarding and mobile patrols, an engineering company recording results from onsite testing to produce compliance certification and invoice immediately and a company creating timesheets and work pattern analysis whilst on construction sites. We’re also seeing an increase in the use of barcoding and near field communication (NFC) tags to record data for goods or equipment and linking this to a location using GPS Geotagging.